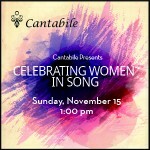 Celebrating Women in Song is a look at women’s influence on choral music, whether as composer, patron, or muse. The centerpiece will be Benjamin Britten’s celebrated Hymn to St. Cecilia. The concert will also feature madrigals from the Triumphs of Oriana, a book of English madrigals assembled in honor of Queen Elizabeth I, as well as excerpts from the Gartenlieder of celebrated German composer Fanny Hansel. Other highlights include works by Holy Minimalist composers John Tavener and Henryk Gorecki, music by Gwyneth Walker, and a choral representation of a pagan fertility rite. Without women, none of us would be here, so please come and join us in this wonderful celebration! This performance is presented as part of the Estes Park Music Festival, and therefore Cantabile is not selling tickets for it. Please see http://www.estesparkmusicfestival.org/winter-concerts.html for additional information, including ticket prices. We hope to see you there!